This is our most up-to-date schedule. As games are added or moved the schedule will be updated accordingly. ​Entry into AIA matches is $4.00. 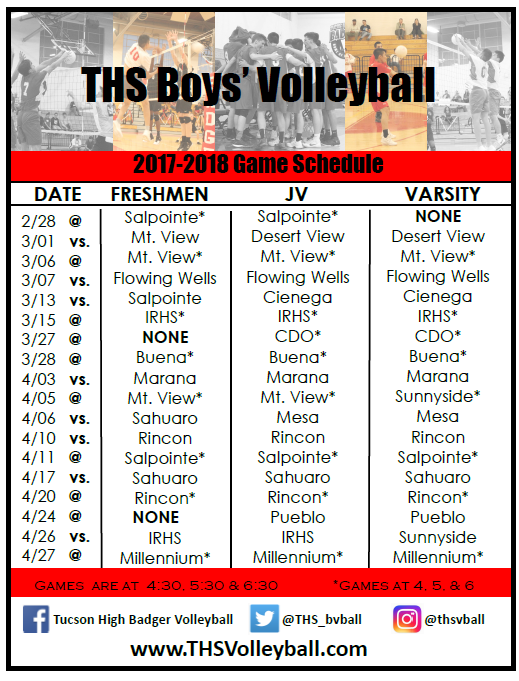 All matches are played in Tucson High's West Gym. *If our opponent is from out of town (Phoenix/Sierra Vista) our matches will start at 4, 5, & 6 PM. Most away matches will start at 4:00, 5:00, & 6:00. Parents will be assigned 3-4 days to volunteer in the snack bar. These days will coincide with the same days that your athlete has to help with 3 ball or line judging. Parents who help in the snack bar will get in free to their player's match. All athletes will be responsible for line judging or helping shag balls during the freshmen, JV, or Varsity matches. It is the athlete's responsibility to know when they are supposed to be helping.